If you are using herbs for any sort of medicinal purpose then you need to get a good book, written by someone who is an authority on the subject, and who can tell you the contra-indications or cautions about particular herbs. 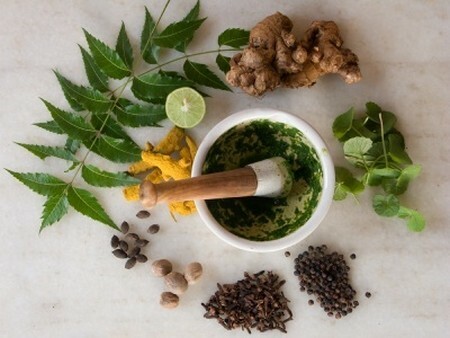 Herbs may be nature’s medicine chest but they don’t come in measured doses and labelled pills. Our ancestors learned by trial and error what was good for us and what wasn’t. We have them to thank for the knowledge that you definitely wouldn’t dose yourself with foxglove, or that certain herbs, while good in small doses, would make you feel very sick if taken in quantity. You need to know what you are doing and to follow some basic rules in order to get the benefits of your own free, organic remedies. It is also wise to check with your doctor if you are not sure what condition you are dealing with. Having said all that, there are many herbs that you can use safely, and the preparation of most of them is as simple as making a cup of tea! Put a teaspoon of the dried herb in a pot, pour on boiling water, cover and leave to brew, then strain off and sweeten with honey if you wish. The strength of flavour in a herb is a useful rule of thumb about how much to use. The most strongly aromatic herbs—such as thyme and sage—contain powerful medicinal oils and you would use them in smaller quantities and for particular needs, for example when you have a bad head cold. On the other hand you could start every day with a cup of chamomile that is also mild enough for children and to soothe teething babies, as well as a pleasant herb infusion for you!